“Chrizellenz 2014” was a pan India Management Fest, in which Top B schools of the country participated and put their skills on display. It was an arena where they were given a chance to showcase their managerial capabilities in front of a crowd of 2500 students in a two-day event. The fest this year was held on 24th and 25th of January 2014. The theme was“prism”, which marks the convergence of talents from the corners of country at the lush greens of the Kengeri Campus. Chrizellenz 2014 was the prism that converged different flavors of events, students, strategies, mind work, management learning into one and above all gave the participants an exhilarating experience. Registrations had started flooding in since November 2013. 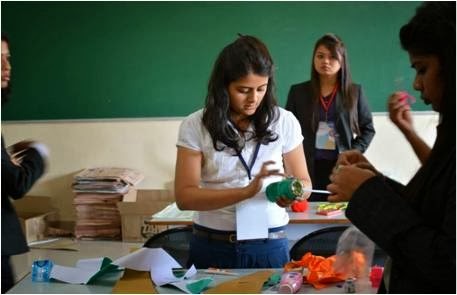 There were 154 participants and 81 teams of management institutes from all over India. Most of the participants were from Institutions of Karnataka like St. Aloysius College, Alliance University, Jain College, SIBM, Kristu Jayanti College, XIME, etc.The others came from outside Karnataka. It was a complete two day learning and entertaining fest for participants and students. Most of them were also given overnight tasks on 24th January for the next day. Food stalls, experience stalls and other entertainment stalls were also put up at the band stand. There was a grand and gala DJ night which marked the end of the fest on 25th January 2014, followed by dinner. 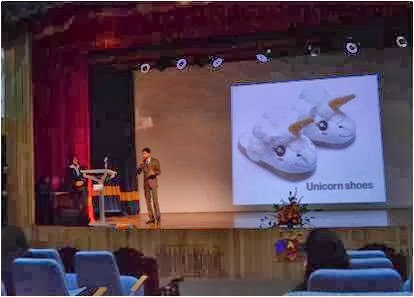 Christ University received a lot of appreciation for designing unique rounds and the always-at-your-service hospitality. The overall crowd of the fest exceeded 3000 this year in the two days of festivity. 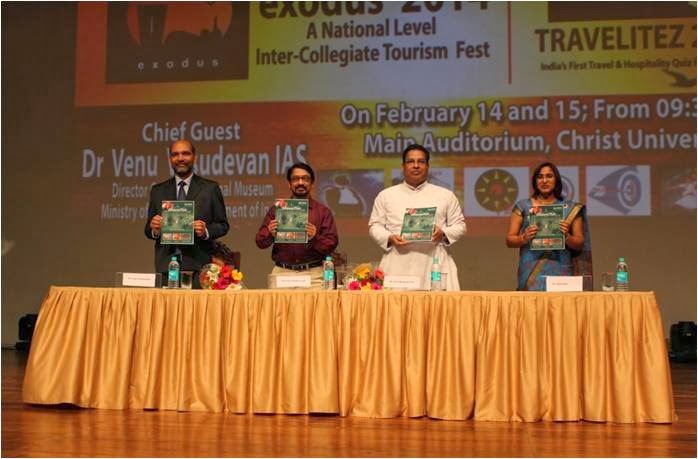 The students of the Master of Tourism Administration (MTA) programme under the Department of Tourism Studies, Christ University, Bangalore organized a two day national level inter-collegiate tourism fest, "EXODUS 2014"on 14 and 15 February 2014. This was the fourteenth year of organizing EXODUS for the Tourism and Hospitality students across the country in order to interact, network, synergise and stay connected with one another. The event was inaugurated by Dr Venu Vasudevan IAS, Director General, National Museum, Ministry of Culture, Government of India on 14 February at 09:30 am in the Christ University Main Auditorium. In his address, Dr Vasudevan shared his views on the present state and the future requirements of the Indian tourism industry. He inspired the students to build on their skills, competencies and attributes, and motivated them to think intelligently and initiate innovative and original ideas so as to empower them to play a more dominant role in this young and dynamic industry. The event also witnessed the release of the latest issues of TRAVELOGUE, the bi-annual magazine of the students of MTA and FREQUENT FLYER, the bi-annual magazine of the students of BCom (Travel and Tourism Management). 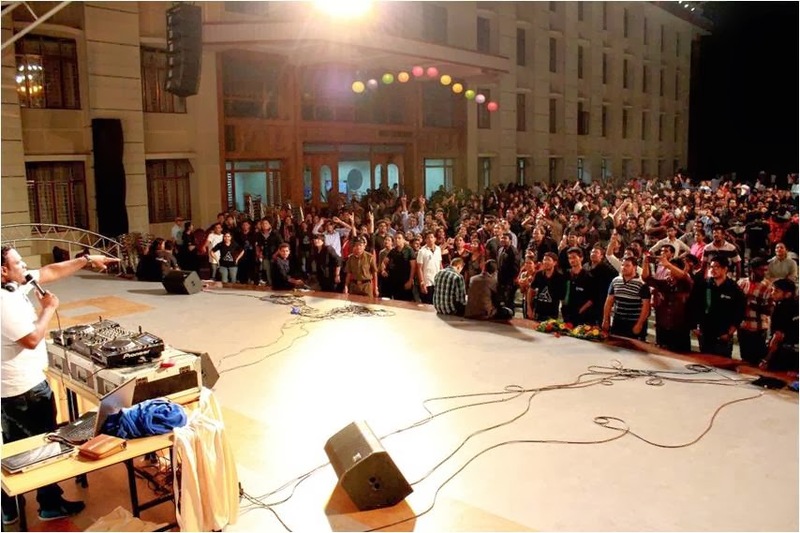 This year, EXODUS played host to close to 200 students from 12 colleges, including nine colleges from outside the city of Bangalore and the state of Karnataka. In the two days, the fest focused on various competitions to test the abilities of the student competitors to enhance their managerial and interpersonal skill sets and face the perplexities in the travel industry. 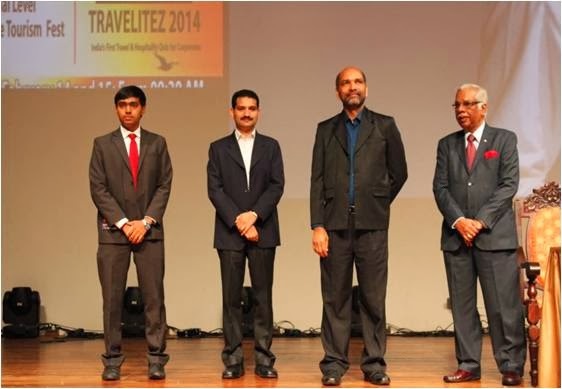 The major highlight of the fest was TRAVELITEZ, the travel and tourism quiz organized exclusively for the corporate members of the travel and tourism industry. TRAVELITEZ has already earned its place in the Limca Book of Records, for being a one of its kind. 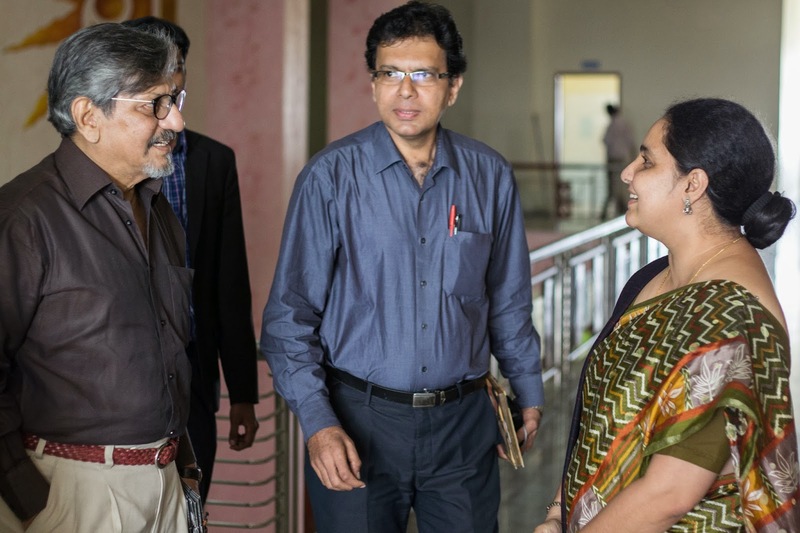 This year the event was hosted by Mr. Arul Mani, prominent writer, faculty and quiz master on 15 February in the Christ University Main Auditorium. Curtains on EXODUS 2014 were finally drawn to a close at 07:30 pm on 15 February in the presence of Mr Manian Krishnan from HPN Global. Trophies and certificates were distributed to all winners. The first place winners of TRAVELITEZ were presented with a gift voucher sponsored by Jungle Lodges and Resorts Ltd., while the runners-up were presented with a gift voucher sponsored by Movenpick Hotel and Spa, Bangalore. 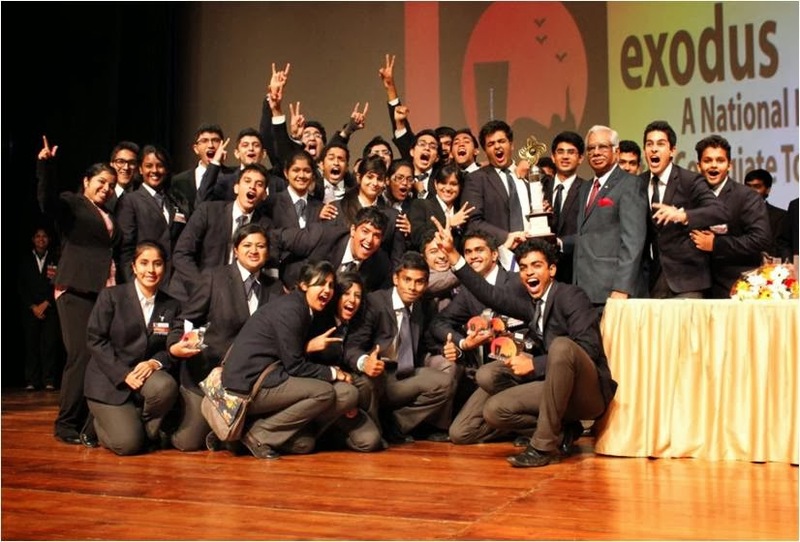 Welcom Group Graduate School of Hotel Administration, Manipal won the overall championship rolling trophy in EXODUS 2014. Dr Joby Thomas, Coordinator, Department of Tourism Studies, Christ University congratulated all winners, and the department and students on the successful conduct of the event. Mr Madhusudhan C R, Student Coordinator for EXODUS 2014 proposed the vote of thanks and signed off, wishing all success for EXODUS 2015. It is a well-known fact that India has been blessed with a youthful population, but in order to channelize this blessing as an effective resource we must look into our education system. The role of teacher, in this context becomes quite prominent. But does the current system of teacher training programmes inculcate the competencies required by an individual to function as an effective teacher? To look into this very issue the School of Education, Christ University has organised a two day National Seminar on ‘Quality Concerns in Teacher Education’. The National Seminar was inaugurated by the chief guest Dr. Vasanth D. Bhatt, Dean of instruction RIE Mysore in the presence of Col. Dr Fr Thomas C Mathew, Vice Chancellor Christ University, Dr Katre Shakuntala, Former Dean of Science, Bangalore University, Fr T V Thomas, Director School of Education, Prof. Mallika Krishnaswami, Dean Humanities and Social Sciences, Prof. Jose Cherian, HOD School of Education, Prof Prakasha GS, Convener of the seminar along with all the delegates, participants, faculty members and students of the School of Education, Christ University. Following the invocation and lighting of the lamp, welcome speech by HOD and the presidential address by Vice Chancellor; Dr Vasanth D Bhatt addressed the audience in an engaging inaugural speech in which he presented his reflections on quality concerns in teacher education. The compendium was released by Vice Chancellor Col. Dr Fr Thomas C Mathew after which Prof. Shakuntala Katre gave the keynote address, Prof. Katre presented an extensive review on quality concerns in teacher education. She spoke about important issues such as emerging national and social priorities, strategies to improve pre-service teacher training, the need for educational leadership and management. The National seminar had 38 paper presenters out of which 30 presenters were from various parts of India such as New Delhi, Mumbai, Pune, Kerala, Tamil Nadu, Andra Pradesh, Noida and Pondichery. The plenary sessions were conducted in two rooms simultaneously on subthemes of the seminar. There were 10 plenary sessions conducted in total on both days along with a panel discussion on second day morning. The theme of panel discussion was ‘Quality concern issues in Teacher education’. Dr Kennedy Andrew Thomas, Director TQMS was a moderator and panellists were Dr Ganesha Batta, Principal MES teacher’s college, Dr S Srikantaswamy, Additional Director Center for research and Dr Sudhakar, former Director, UGC Academic Staff College. The panelists spoke on topics like Training the Teachers for Classroom Managment by Dr Srikanta Swamy and Dr Sudhakar spoke on internship in Teacher education and Dr Ganesha Batta spoke on general issues of Teacher Education. Some of the significant concerns discussed during plenary sessions were; ICT to be integrated in every aspect of teacher education, developing teaching competency as a quality indicator, principles of class room management to enhance quality, life skills training for teachers and integrating multiple intelligence in teaching-learning. The National seminar was concluded with a valedictory ceremony presided over by Fr T V Thomas, Director School of Education. Prof Prakasha Convener of National Seminar gave the Seminar report following which certificates were given to all the delegates. Electronics Club organizes one awareness program every year under the event name “i2R”. This time, “i2R”, an awareness campaign on e-waste and its management was organized by the II year BSc (PME and CME) students on Friday, 14 February 2014 as a part of Electronics Club activities. 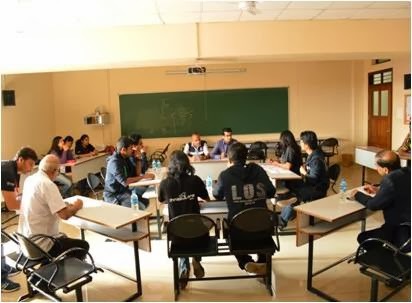 There were about 20 teams from both PME and CME classes taking part in this campaign and campaign was held in the Christ University Campus. The students explained the significance of understanding the e-waste and its management to the visitors. 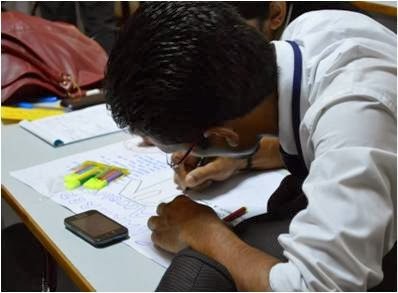 They also showed the charts and power point presentations with a lot of statistics to highlight the harmful effects of the chemicals and materials present in the discarded electronics gadgets like mobile phones, calculators, televisions, PC mother boards etc. They handed over a pamphlet with a brief description on e-waste, responsibility of the user and also details about a few government departments and NGOs working in managing the e-waste. The participating teams were very happy after the event that, they could sensitize their fellow friends, Christites with regard to the e-waste. The faculty members of other departments also interacted with students during the program. All the faculty members of the department of Electronics were present during the program and provided necessary guidance to the students. Department of Media Studies in its 2nd lecture/screening series ‘Utsav’-Celebrating 100 years of Indian Cinema witnessed one more stalwart from the Indian film industry on 30th of January 2014. Shri Amol Palekar one of the most renowned movie icons of Marathi film industry was the chief guest this time. The event showcased Amol Palekar’s critically acclaimed film ‘Quest’ which has been part of various national and international film festivals. The screening was then followed by an interactive session with the students. During this session Amol Palekar highlighted the importance of other language cinema and how these films are gradually getting neglected and how they face tough competition from popular hindi cinema for their survival. He appreciated the efforts of the Department of media studies in bridging the gap and felicitating filmmakers from regional cinemas through ‘Utsav’. He also stated that the Indian movies have a great market in the International level and the film industry in general is doing incredibly good. He mentioned about couple of his movies from the ‘Directors Diary’. Ms Sandhya Gokhale who is the writer of the film discussed the difficulties the team faced in getting the release of the film. This event was organised under the guidance of HOD Prof Naresh Rao and convenor of the series Prof Aasita Bali.